Owner is impeccable as well as the rest of his stuff and family. I was impressed and humbled by their attention and politeness. You know this feeling when you think you know someone for your whole life but in reality you spent only a few moments together. Thank you for everything! The staff was welcoming and accommodating. The room was new, modern, generously sized, and tastefully decorated. The beds were comfortable. The water pressure was great. The bathrooms were great. The views were amazing. I loved that the living room and bedroom had tv's. This accommodated my family very well, as did the two bathrooms. We were able to store some drinks and snacks in the fridge. The kitchen was great. Overall we had an amazing experience. Close to beach and restaurants, cosy village. Extremely helpful owner and personnel. Excellent breakfast served in the room. Perfect with a washing machine. Everywhere neat and clean. Excellent views, friendly staff, clean, good breakfast, excellent service, close to beaches and restaurants, spacious and nicely decorated. Special thanks to the staff, you make the hotell nice and cosy! Friendly staff, small hotel with a “family “ feeling. We felt very welcome. The apartment was spacious and fresh. We had two big balconies with amazing view of the ocean. Order breakfast- it is fabulous 😃 We warmly recommend this hotel. 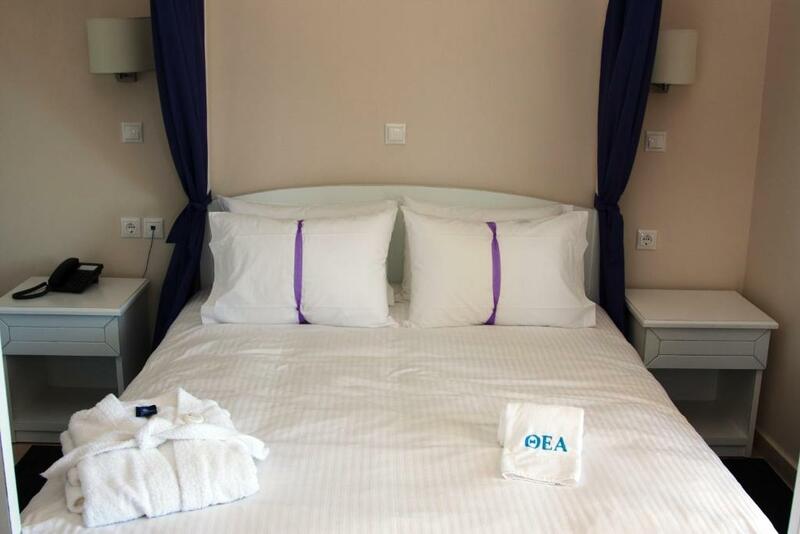 Lock in a great price for Hotel Thea – rated 9.6 by recent guests! Hotel Thea This rating is a reflection of how the property compares to the industry standard when it comes to price, facilities and services available. It's based on a self-evaluation by the property. Use this rating to help choose your stay! 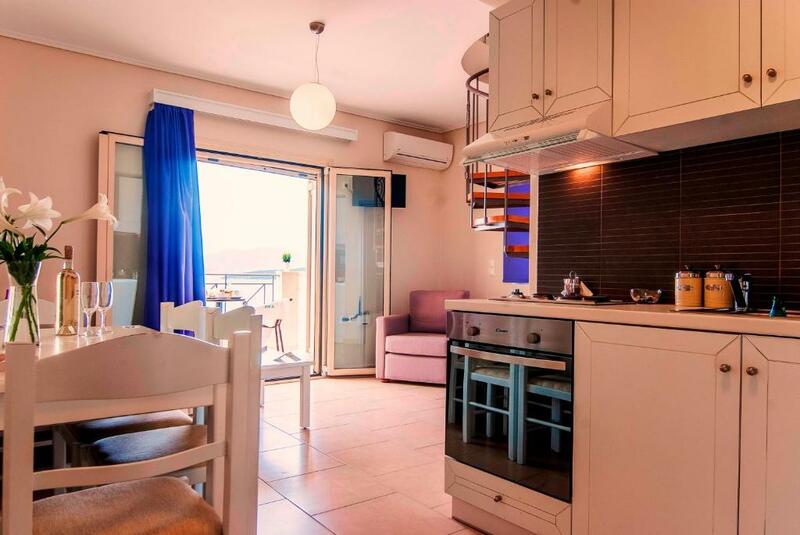 One of our top picks in Marmari.Just 250 feet from Kavos Beach, Hotel Thea offers studios and apartments that open to a balcony or patio with Euboean Gulf views. Free WiFi is available in all areas. Marmari Port is a few feet away. 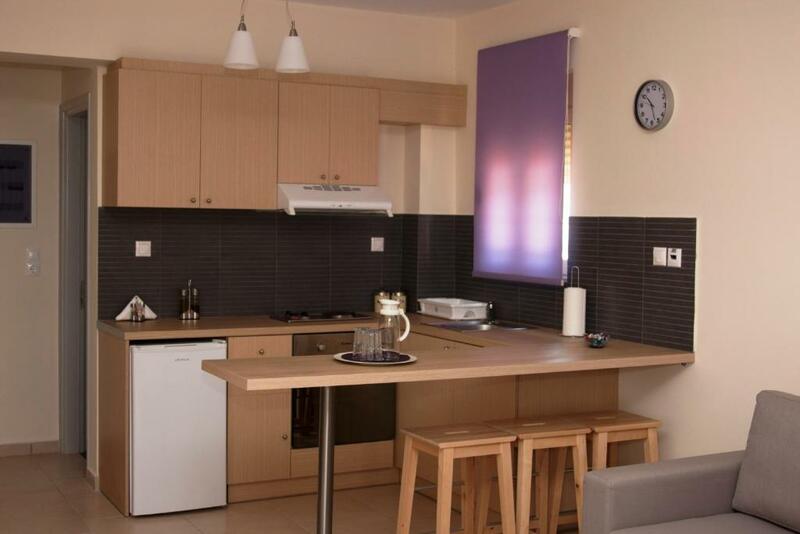 Each self-catering unit here will provide you with air conditioning and a fully equipped kitchen. 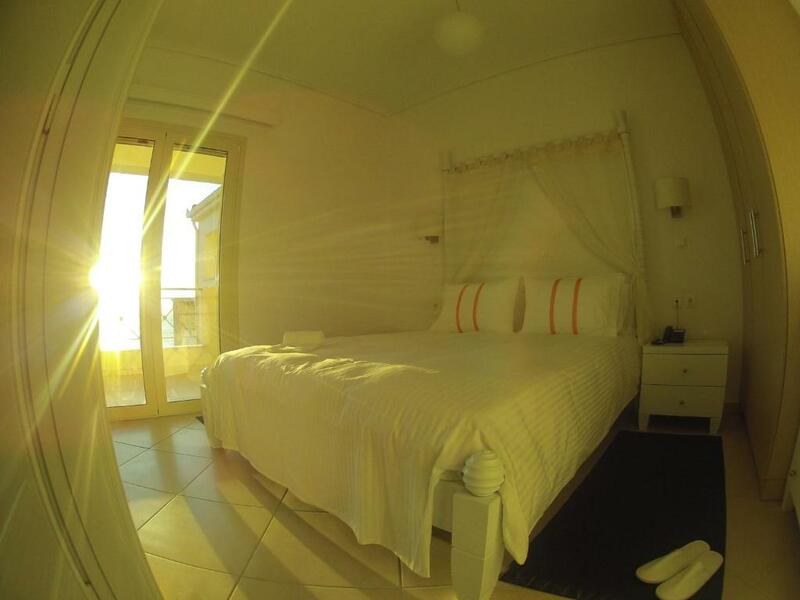 Featuring a shower, private bathroom also comes with free toiletries and a hairdryer. A washing machine and safe come standard. Breakfast is served daily including local products at the time of guests' choice. At Hotel Thea you will find shuttle service, a 24-hour front desk and a garden. Other facilities offered at the property include a communal lounge, a ticket service and a tour desk. The hotel is 650 feet from Marmari Center. 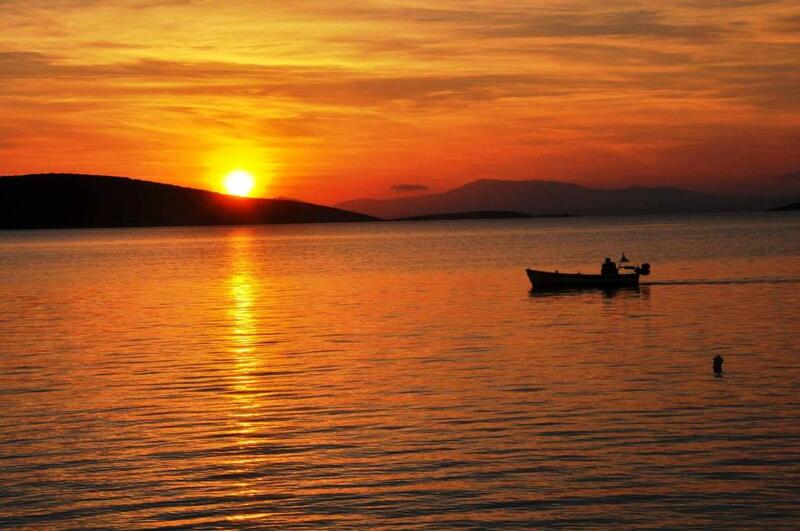 The beaches of Kokkini and Fugia are 0.6 mi away, while Megali Ammos Beach is within 1.2 mi. Free public parking is possible at a location nearby. When would you like to stay at Hotel Thea? 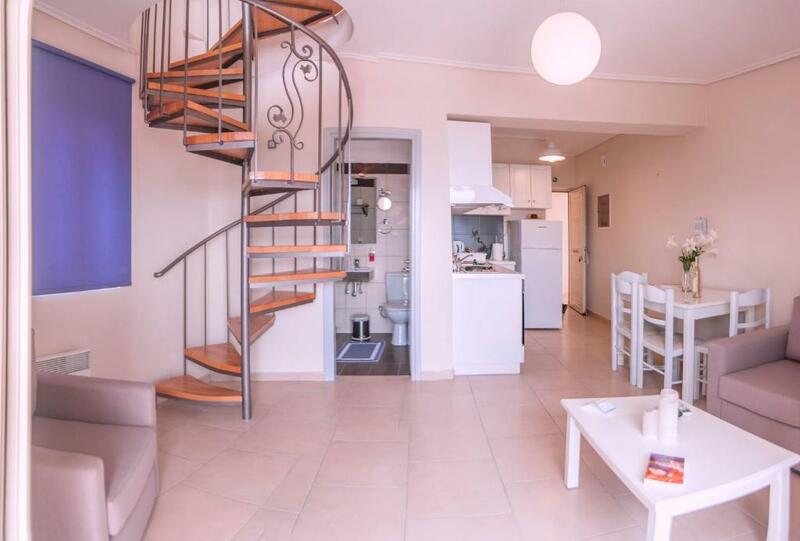 This apartment features a stovetop, private entrance and electric kettle. 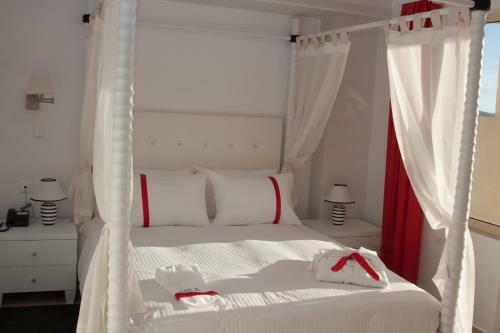 Please note that this room type is specially designed and accommodated guests with mobility issues. Also note that as this room type does not have a balcony or veranda, smoking is not allowed. It is built on a hill 80 meters from the Harbour and 200 from the local market. 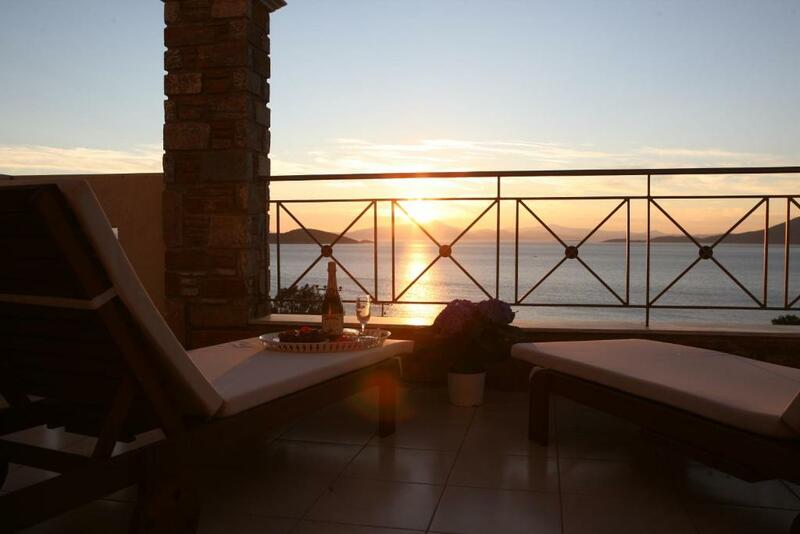 It has stunning views of the Bay of the southern Evoikos gulf and offers refined handmade breakfast as you like it served apart from the lobby and into your room. The eager staff working from the opening of the hotel and constantly trained through seminars for upgrading our services. Their free time, most dealing with sports, sea, photography and volunteering. Η πανέμορφη γειτονιά μας, αρέσει πολύ,..και αρέσει γιατί προσφέρει πανοραμική άποψη του Μαρμαρίου, μιας και έχετε την δυνατότητα να απολαύσετε βουνό με καταπράσινη φύση και θάλασσα μαζί! Στους επισκέπτες μας ακόμα αρέσουν, τα τιτιβίσματα από τα πουλάκια, η πρωινή λαλιά του κόκορα, το παζλ των χρωμάτων της φύσης στους πρόποδες του βουνού δυτικά, τα καΐκια που κινούνται συνεχώς μέσα στον κόλπο και το μώλο του χωριού ανατολικά, τα προβατάκια που βοσκούν αμέριμνα στην απέναντι πλαγιά, ο ψαράς που σηκώνει το δίχτυ του ακριβώς μπροστά μας νότια, στον μικρο και γραφικό κολπίσκο του ''Μικρού Μαρμαρίου''. Το συγκρότημα επειδή ακριβώς είναι χτισμένο στον υψηλότερο λοφίσκο εντός χωρίου, κυριολεκτικά διαθέτει 360 μοίρες οπτική! Επίσης, συνδέετε, με το μοναδικό πολύχρωμο δρομάκι με σκαλοπάτια που οδηγεί κατευθείαν στο Λιμάνι με τα πλοία και γενικότερα, διαθέτει, πολύ εύκολη πρόσβαση σε όλα σχεδόν τα σημεία , αφού απέχει μόλις 300 μέτρα από το κέντρο αλλά και το Λιμάνι! Υπάρχει αρκετή ησυχία να χαλαρώσετε και σχετικά άπλετος χώρος, ..το μόνο που έχετε να κάνετε είναι απολαύσετε ή να βγάλετε τα ποδήλατά ή τα πατίνια σας και να ποδηλατήσετε ανενόχλητοι, μακριά από τους επικίνδυνους δρόμους. House Rules Hotel Thea takes special requests – add in the next step! Hotel Thea accepts these cards and reserves the right to temporarily hold an amount prior to arrival. Please note that extra beds or cot are provided upon request and upon confirmation by the property. Please note that guests checking out before the booked check-out date and up to 15:00 will be charged 50% of the room price. Guests checking out after 15:00 will be charged 100% of the room price. Please note that extra beds or baby cots are subject to availability, need to be confirmed with the hotel and are payable locally. There was a lot of noise produced from pipes and toilets coming from other apartmants bathrooms, especially at first night I came. Fortunately things improved my second night but bear in mind that ground floor apartments may be noiser. Everything, location, view, hospitality, spotless clean, breakfast served in the room/balcony. Dimitris and his team makes you feel perfect, at the hotel ( who should have at least 4*,with the great conditions, and with all the facilities you need-even a washing machine :)). He give us the best recommendations for beaches and taverns in the south part of the island. Everything was marvelous!!! Comfy mattress, polite staff, delicious breakfast, super clean. Will DEFINITELY visit again. We could not fault anything at this lovely hotel, from the warm welcome given to us by Aris when we arrived to the fabulous location and helpful information we recieved. The apartment was spacious and well equipped and the whole atmosphere delightful. We hope to revisit one day. Nice view, very big balconies, two bathrooms, a very very spacious snd nice place to stay with very friendly and accommodating staff. Cannot recommended highly enough.